“Answer to the Serious Musician’s Prayer"
The Seagull Maritime SWS Rosewood SG is the answer to any serious musician’s prayer. 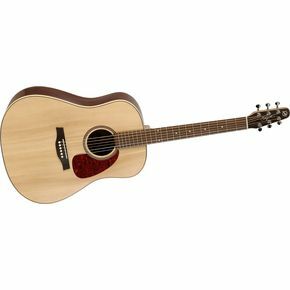 Slightly smaller than your standard dreadnought, this steel string acoustic is made with a pressure-tested solid spruce top and solid rosewood body giving it a rich, full-bodied sound that is usually only associated with a full-sized dreadnought. In fact, the slightly smaller size of this guitar, particularly the narrower top makes certain that you don’t get that boxy ‘boomy’ sound that can be the downfall of standard dreadnoughts. No, this beauty’s sound is full. It fills up the guitar just as it fills up your head with its mellow flavor. A great feature of the Maritime SWS Rosewood SG is its neck; beautiful, yes, but its true beauty is in its technology. It has a compound curve in the top that lends it incredible stability, meaning that you get an awesome and sustained pitch. Its headstock is tapered in such a way that once you’ve tuned it, it will hold it for a good long time; even serious playing won’t pull it out of tune. While being a steel string means that you will have to put heavier pressure on the strings to get your full sound and clarity, this beauty lends itself well to pick-style playing and even has the pick guard to protect its satiny, semi-gloss finish. At <$800, it is a steal and the answer to the serious musician’s prayer for a quality instrument. Shop safe at Musician's Friend and enjoy FREE SHIPPING on EVERYTHING! I have owned numerous guitars, but my all-time favourite is a 'Gull' Maritime Minijumbo SWS HG. It, too, rivals Taylors costing much more. Seagull Guitars rock! My buddy played his taylor 5 series and my seagull sws rosewood sounds better, at a 1/4 of the price. Mamma, buy me one of those....!! Seagull is known for this type of thing. Meticulously hand crafted instruments of the finest materials at refreshingly affordable prices. It would be a grave error to dismiss this or any other 'Gull just because of the low price point. This one is as fine as many costing four or five times as much....And it's made in Canada...eh!! Join in and write your own page! It's easy to do. How? Simply click here to return to Seagull Guitars.